Thanks Andy! Point well made. I of course could be wrong, but this clearly appears to me to be intended as a beauty shot. You appear to be speaking of artistic images or portraiture. In a beauty shot, you aren't really looking for a story, significance, voice, or character from the model. You're conveying beauty to make people want your stuff. I agree that some of the comments on these posts are more disparaging than useful, although people are entitled to their opinions. Some of these criticisms are perfectly valid, and as someone said, you don't have to be a retoucher to see when something looks unnatural or uncomfortable to the eye. 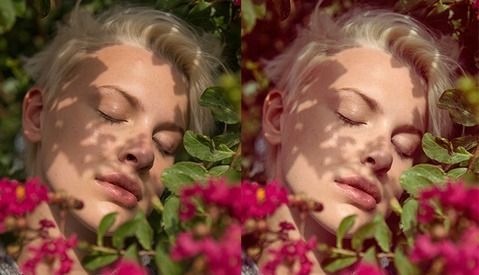 Perfection in retouching can be artful, even if it isn't realistic. I personally like the look. My only criticisms of this retouch are that the 3-dimensional look of the cheeks has been flattened out too much for my taste, and the reduced highlights and color on the fingers makes them look flat and ashy. These are subtle if you don't have the before image to compare. They aren't a big deal in portrait work, although for high-end fashion and beauty images for publication, they are relevant details. From my point of view, it's a decent retouch. I love how you handled the blemishes on the cheeks and still managed to maintain texture, also the work on the eyes which gave the hole face more symmetry and impact. However, to me, some things are off... like the tone of the hands that actually looked better in the "before" since they had more contrast and they became this flat dark tone with odd color halos on the edges. Also the lower edge of the chin maintains certain "noise" that seems to be quite different from the rest of the texture on the face so it looks pretty odd. Now what I think was truly unnecessary was the liquefying of the fingers and the ears... I mean... I would've preferred you got rid of the wrinkles bellow the eyes before you made her ears "look better" which no one would've noticed anyway. As a photographer, I'd certainly love to work with you because of your great skills and I guess that always the end product is the result of direction, which can be given the photographer or client, so I would understand why sometimes the retouch has got to be "excessive"
Well... that's only my personal opinion, I hope it helps in anyway. The work is amazing! This is a real art form, and Kristina is a wonderful artist. It is the message that is screwed up. wow, I think its amazing work Kristen. The even illumination on your retouched piece is kinda stunning. One question, when I see many of these portraits, I always notice the very visible light source reflecting in the eye. I'm not talking about the specular highlight but the one where you can actually see the multiple rings and hotspot of a real light source. How come that always get's left in there? It seem's like you'd want to remove that. Not a criticism at all, just interested! Thx for sharing. "I was shocked, as Sherk not only easily erased 10 years off the model, but even more amazingly did it without making it look fake." what???? 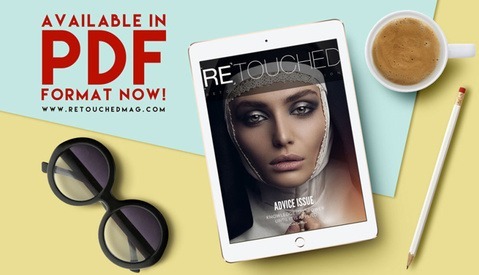 Thaaaat's right... lets all have a slam the retoucher day. It's all our fault that society has unrealistic expectations, isn't it? You realise, this is what clients WANT right? This is what we're asked to do. Daily. And more! And yes, it IS an art in its own right. And some of us actually ENJOY the challenge, even if that makes us evil contributors to young girls self esteem issues. Do you know how beauty advertising works? They WANT you to feel bad about yourself! If you feel bad about yourself, then maybe you'll buy their product to make yourself feel better. At least this retoucher still left a few pores. Stop buying magazines if this offends you. I haven't bought one (that wasn't Photoshop related) in 15 years, and if your kids are looking at mags like Cosmo, you've got far more to worry about than a retouched photo. Have you read their articles? Unfortunately most of the "haters" aren't pro photographers. They are pixel counters and monied armatures. They have lots of cameras and lenses, shoot weddings for $75 and hand over a memory stick. They also spend a lot of time on this site pulling others down. Canon/Nikon fanboys, bla-bla-bla. If they were real pros, they would realize this photo isn't a portrait or something you show your friends on FB. A photo of this type isn't taken for any other reason then to SELL SOMETHING. A concept lost on most amateurs. Skin cream, perfume, fashion etc. in this case, what is being sold is a Photoshop class or this persons retouching services. It does that really well. For a pro, this kind of photo is real bread and butter, lots of $$$$$, and yes it's going to be "retouched" to this level and far beyond. Armatures, when you see a photo like this think $$$$$ in someone's pocket. Sherk did a WONDERFUL job here. She can probably name her price for this kind of work, and agencies will happily pay. Armatures, you have to realize that when you have this kind of skill, you are also able to practice restraint when that is what is called for. With that advent of digital, every snap shooter thinks they are a Photographer. Do you know what's annoying? People telling haters to "post up your own work". That just implies that it's OK to "hate" as long as your work is better than that person's. When people offer brief comments like, "Wow, this is great"... Nobody tells them to "post up your own work". So why is there a double standard? All criticism is equally valid, nobody's really "hating". Be thankful for it. I did not take my time to read all of this, but some comments are hilarious for sure!